The 34.6 metre motor yacht Hunter has been listed for sale by Burgess. With exterior styling and interior design by Stefano Righini, Hunter was built in GRP by Italian yard Falcon Yachts to RINA class and delivered in 2004 with a refit in 2017. An interior in rich cherry wood trimmed with fine leather accommodates 12 guests in six cabins comprising a main deck master suite, VIP suite, two doubles and two twins. 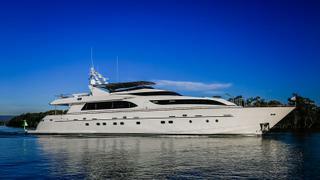 All cabins on this yacht for sale have entertainment centres, television screens and en suite bathroom facilities. The saloon is surrounded by wrap around windows creating a light and airy area with comfortable seating, a bar and an entertainment centre including a large flat screen television while forward is a formal dining room with seating for 12 guests. A sheltered aft deck with seating and a table offers plenty of space for entertaining outdoors while the sundeck offers further al fresco entertainment with a Jacuzzi spa tub, barbecue grill, settees, table, sun pads and sun loungers, all sheltered by a hard top. Her 2017 refit brought her back into RINA class and she is also now certified for charter should a new owner want to ensure that she pays her way. Twin 2,833hp MTU diesel engines power her to a cruising speed of 24 knots, topping out at 28 knots, and she is fitted with Naiad digital fin zero speed stabilisers. Lying in Sydney, Australia, Hunter is asking €4,195,000.